Magnificent Douglas fir, Scots pine and some larch form a shelter for the maturing beech trees found throughout the wood. Ferns and bluebells spread across the woodland floor, deer - creatures of habit - find their way though the holly leaving their well-trod trails. It's located in a pretty farmed landscape at the top of a small valley just inside the South Downs National Park. Most of the wood is level with a slope at the north side down to Brightstone Lane, the track on the east side provides access to the whole wood from the metal field gate at the lane side. Along the western boundary the old beech, cherry and hornbeam arch over into the woodland creating clear open areas below, perfect secluded spots for camping and relaxing. The wood is private, there is a bridleway along the eastern boundary and a public footpath along the southside. This part of Hampshire is Jane Austen country from where she took inspiration for her novels from the 'locals', the places and the landscape. The Domesday book refers to Farringdon as Feredone which, when translated, is a fern-covered hillside; ferns are seen through most of the wood and seem to thrive. The other most notable local, Gilbert White, was one of the first to really study ecology and his calendar from 1795 is a valuable reference point. He may well have focused his attention on the woodlands here which probably looked very different in his day. Are indicated by turqouise markings on posts and trees. They are: to the east the are free-standing posts alongside the forest track, 3 metres from its centre, to the west a tree-topped forest bank by the open field and to the south 2 metres from the path centre. 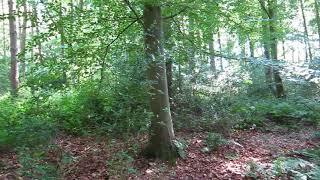 Massey Wood is about 4 miles south of Alton and about 15 miles east of Winchester in East Hampshire. 1.Click here for Bing Maps Directions enter your own postcode, (the coordinates for the double wooden entrance gates are already entered) and click on the "Go" box. Park by the 'woodlands for sale' sign on the big beech tree. Coming up the lane it's on the left and down the lane on the right. go through the small bridleway gate and the wood is on the right. 2. For Satnav: the nearest postcode is GU34 3ET in Brightstone Lane as shown by the red dot on the maps.